Ever wondered how your mobile manners rank? Read through the results of the latest iPass survey to see how your mobile etiquette compares to others. iPass just published the latest edition of the Global Mobile Workforce Report. Along with the usual great insights on mobile device penetration (now 98%) and mobile applications usage this time the iPass survey reveals some more personal habits with regard to the use of mobile technology – including its use in the bedroom. Here are some nuggets from the report. Read through to see how your mobile etiquette compares to others. Are you afraid to admit that you go to sleep with your iPhone? Well, don’t feel bad because you are not alone. 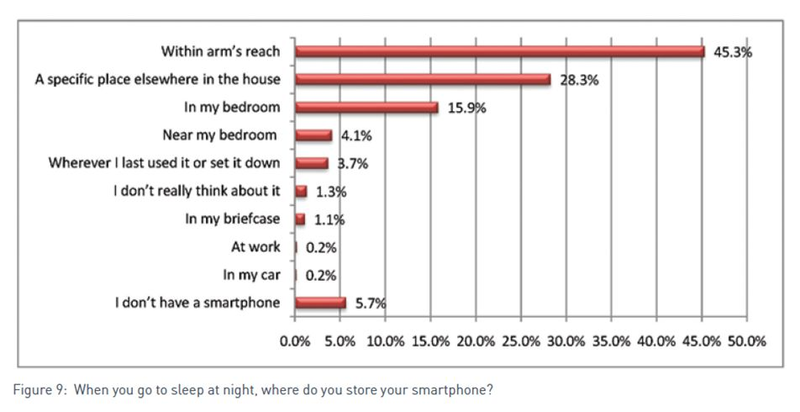 In fact almost one half (43%) of the mobile workers surveyed by iPass store their smartphones within arm’s reach when they sleep at night. I have to admit I am one of those who carry not just the smartphone to bed but also the laptop – and more recently the iPad. Besides being my smartphone the only phone line I have – I closed my home landline long time ago when I realized only telemarketers would call me at that number, I like to end the day by watching movies or streaming videos on my laptop – YouTube and Hulu being my favorites of the moment. And hey, it comes handy to have the smartphone in reach when I wake up in the morning. If the last thing I do before falling asleep is to close the lid of my laptop and put it under the bed, the first thing I do in the morning when I open my eyes is to check the email on my iPhone. Sounds familiar? Well, according to iPass when mobile workers wake up in the morning, a good third of them (35%) check email before anything else including getting dressed or eating breakfast. And here is where things get a little more controversial: the survey suggests that those who take their smartphones to bed are 60% more likely than average to wake during the night to check their smartphone. Albeit with some local variations, this seems to be a global reality. Those living in Asia Pacific are the least rested with 55% of mobile workers waking at least occasionally to check their smartphone or tablet, and 19% wake every night. Europeans are the most rested with only 27% waking at least occasionally, and 4% waking every night. I wonder whether these folks wake up because their phone is in reach or if they are actually taking the phones to bed because they already know they can’t sleep all through the night anyway. Yes, this is all too true but there are justifiable facts that go with this smart phone phenomenon, first more and more people are doing away with their landline phone just another reason to have it next to your bed. I am not a talker and only use 100 of my unlimited minutes, but it keeps my schedule organize and my bills paid on time not to mention all the cool apps that just makes your everyday busy schedule a little more manageable.